Do you want to “Do Business Better”? 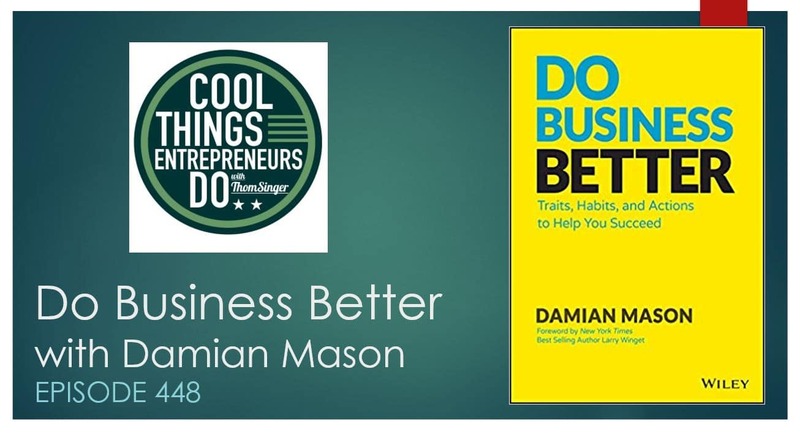 If yes, you need to listen to episode 448 of “Cool Things Entrepreneurs Do”.Thom Singer sits down with Damian Mason to discuss his new book, Do Business Better. This is a special edition for CTED. The Tuesday episodes are usually a solo conversation with Thom sharing his thoughts and ideas. But he recently had the chance to visit with Damian in Austin, and the two decided to record a special interview. Since his book is brand new, Thom wanted to release this conversation immediately so that all listeners can get started on how to “do business better”. As an entrepreneur, you are always seeking ways to improve your business. All the business planning in the world will not do the trick. You have to be out there taking actions. In his new book, Mr Mason talks about the traits, habits and actions to help you succeed. Small businesses that follow his advice should quickly see movement in their bottom line. Too many business “experts” simply tout customer service and social media. Damian goes deep and shows you the “how”, not just the “why”. Learn the Four Unwavering Traits of Entrepreneurial Success and how to discover the differences between routines and habits, then implement your changes through meaningful actions that create permanent improvement. Along the way, you’ll learn from real-world examples and relatable stories, and discover a wealth of applicable advice on starting, managing, and growing your own enterprise. Thom Singer is a funny keynote speaker and a professional master of ceremonies / EmCee. 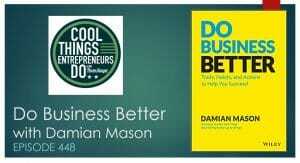 He is the host of the “Cool Things Entrepreneurs Do” podcast and the author of 12 books. He launched the “CTED” podcast five years ago with the intention of helping himself and the community of podcast listeners to discover fresh ideas on entrepreneurship. Thom believes that success leaves clues, and when you hear from smart people, you will find your own ways to do business better.